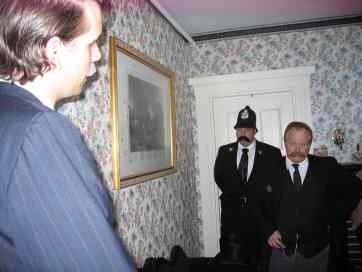 Dr. Cornelia to reveal Borden killer? In case you missed it- an old theory back for another round. 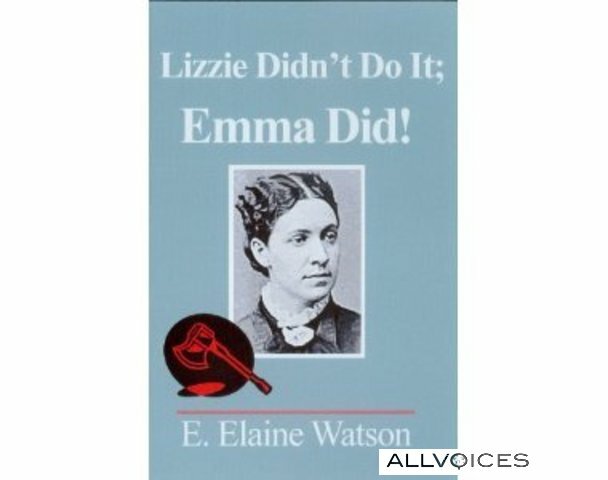 Review at http://www.allvoices.com/contributed-news/8028572-lizzie-borden-didnt-do-ittrue-crime-solved Hard copy by Branden Books, or available now for Kindle. One of the most-viewed features of Warps and Wefts this year has been the newspaper clippings from all over the country detailing the most minute bits of information about the Borden case and personalities involved. Of course newspapers do make mistakes, and when information is lacking, some unscrupulous reporters were not above inventing details to fill in the gaps. With a little careful sifting, there are some golden nuggets to be found. Thanks to Ancestry.com and Newspaper Archives.com, all of this is available to the public. Here is a very interesting paragraph which was buried in the Davenport (Iowa) Tribune, August 25, 1892. 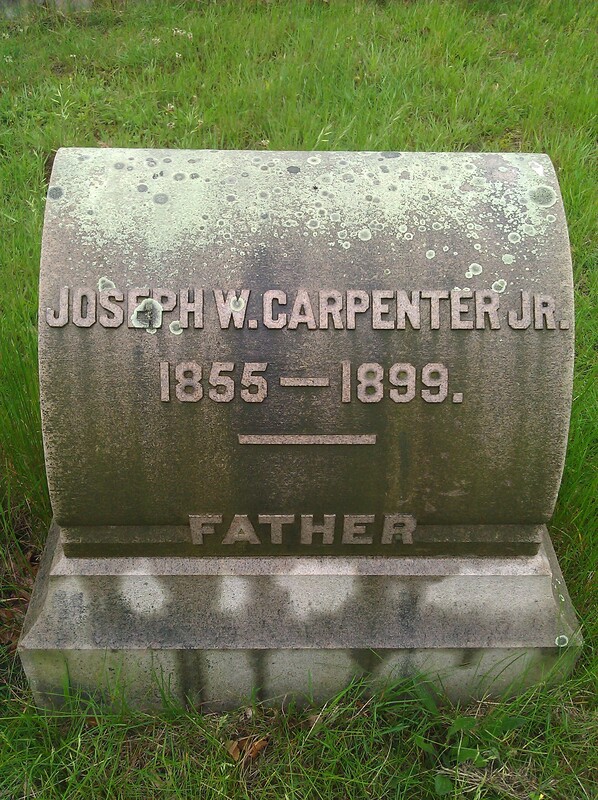 It’s unfortunate the Borden family threw notes and letters away so readily. The famous note sent to Abby Borden asking her to come visit a sick friend went missing, even though a reward of $500 dollars was offered for information about the sick friend’s name, who wrote the note, and who delivered it. It was suggested by Lizzie that it may have been burned up (in the kitchen woodstove as that was the only fire in August). 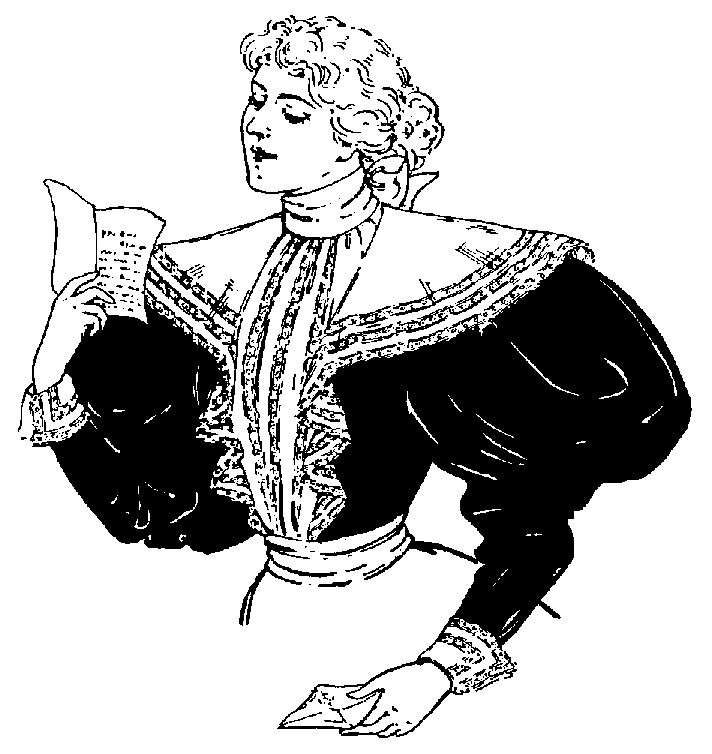 Emma Borden was visiting the Brownells on Green Street in Fairhaven during the week of the murder, which must be where the letter mentioned in the article above was sent. 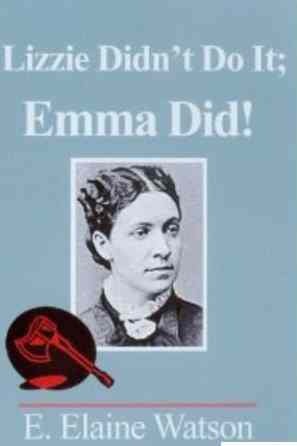 On the morning of the murders, Lizzie gave her father a letter to mail to Emma in Fairhaven. The letter mentioned above must have been written before the letter written and given to Andrew Borden to mail on August 4th. How unfortunate Emma did not keep the letter which mentions Lizzie’s “suspicious man”, which would have added credence to her tale to the police about such a character later. Or, did Lizzie make up the “suspicious” man loitering around the property as a convenient suspect to draw attention away from herself later? To whom did Emma show that letter- most likely Mrs. Brownell and her daughter Helen. Lizzie mentioned the suspicious man idea to her friend Alice Russell the night before the murders. Was Lizzie telling the truth- or cleverly covering all of her bases? Did Emma’s friends who saw the letter ever get to relay that information to the police? Tonight the popular Travel Channel program, Mysteries at the Museum, which features unusual artifacts from around the country, presented a segment on the handle-less hatchet found in the Borden cellar. 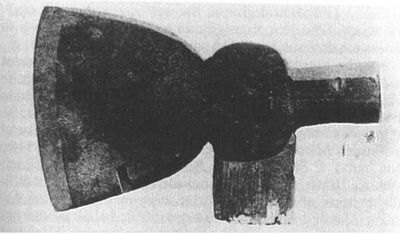 The segment filmed at the Fall River Historical Society and the house on Second Street and showed excellent close-up footage of the hatchet head and break on the handle stub. The seven-minute portion was well-done and worth a look. It airs again tomorrow, December 1st at 3 p.m.
One thrilling scenario made the rounds of who-dunnit in the newspapers after the grisly remains of Abby and Andrew Borden were discovered – one or more savage sailors slithered into the Borden home and extracted revenge for Andrew Borden’s testimony against them involving a mutiny at sea! 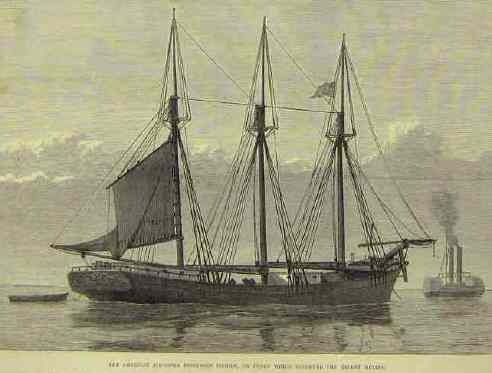 It was juicy stuff to be sure, and the Jefferson Borden did exist (at one point the article references the Richard Borden as being the schooner)- the only difficulty was that Abby and Andrew Borden were not on board- and the mutineers were not free at the time of the murders. Still, it makes for a dramatic story. Here’s one that may have slipped by unnoticed. It sells from $6- $131 dollars depending on where you hunt for it. Amazon has the best deals. Chances are you have not heard of the Garst Museum in Greenville, Ohio unless you are a fan of Greenville- born world traveller and TV star Lowell Thomas whose adventures enthralled millions on radio and later television. Or perhaps sharpshooter Annie Oakley, about whom the Garst has produced a world-class exhibit about her life. As part of their autumn lecture series, another famous lady will be featured as subject of a one-woman show as Christy Igo takes on Lizzie Borden- no sharp-shooting pistol, but a hatchet just as deadly. 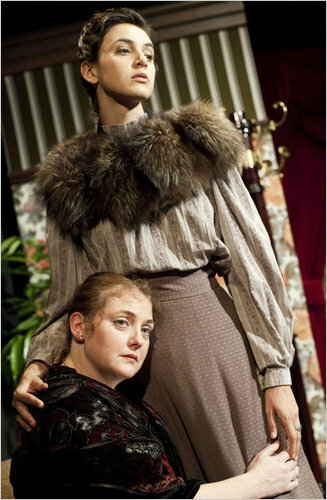 “Sunday, October 10, 2010 at 2:00 p.m., Christy Igo’s program “Lizzie Borden: A Life” is coming to the Garst. It is full of laughter, mystery, and horror as she brings Lizzie Borden to life to tell HER STORY of the murder of her beloved father and step mother. This crime is one of the bloodiest, most notorious and mysterious crimes of the 19th century! 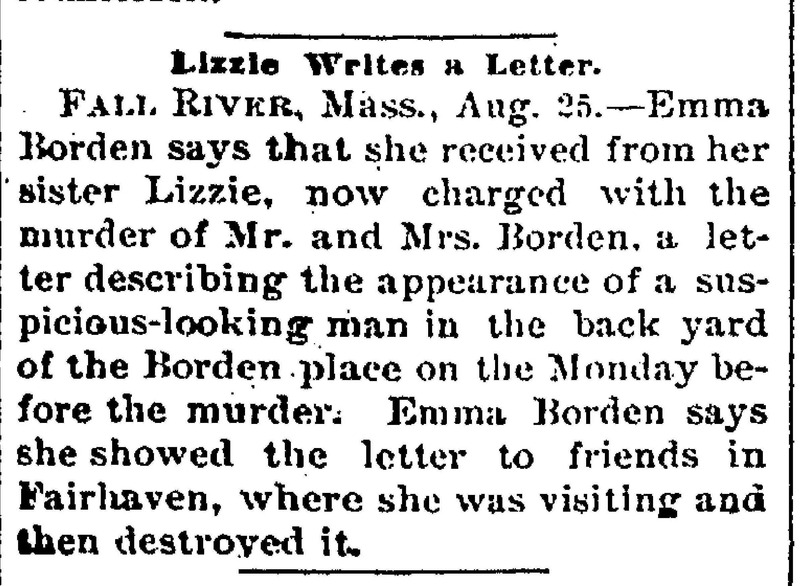 In 1892 Lizzie Borden was found NOT guilty by a jury of her peers. Most of the towns folk of Falls River, Massachusetts DISAGREED. The trial received worldwide media attention. Lizzie became a celebrity. The gruesome details played out in the daily newspapers. Did she or didn’t she? Modern law students still argue the case. You be the judge. Christy Igo trained at Ohio University’s Professional Actor Training Program as well as at the American Academy of Dramatic Arts in New York City. She has worked professionally all over the North Eastern United States. She has worked in film, commercials and documentaries. She formed HerStory productions in 1999 to produce and perform original one woman shows about inspirational women from history. This just in from Andy Propst via Theatermania.com for all those wondering about Lizzie Borden, the rock musical which is included as part of new theatre projects during the National Alliance for Musical Theatre’s Festival of New Musicals in Manhattan this fall. “Steven Cheslik-DeMeyer, Alan Stevens Hewitt and Tim Maner’s musical about murderess Lizzie Borden will feature Carrie Cimma in the title role, along with Jenny Fellner, Marie France Arcilla and Beth Malone. The piece will be staged by Victoria Bussert, with music direction by Matt Hinkley.” The production website is at http://lizziebordentheshow.com/index.php/axe/about/ for more. Most recently the show ran for six weeks in fall 2009 at the Living Theatre in New York as a full-length original rock musical, produced by Took An Axe Productions. Reviews still coming in for the new production by the Blue Coyote Group. Much praise has been lavished on the costume designer, and word has leaked that a “theory” about the crime is suggested in the production. 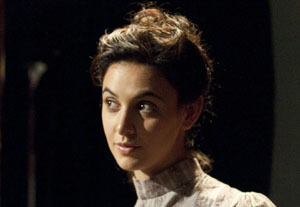 The interaction between Lizzie and her sister Emma is praised by critics as a strong element in the play, and the play in general is receiving positive reviews. Get down to the Access theatre soon , for the play closes October 9th! 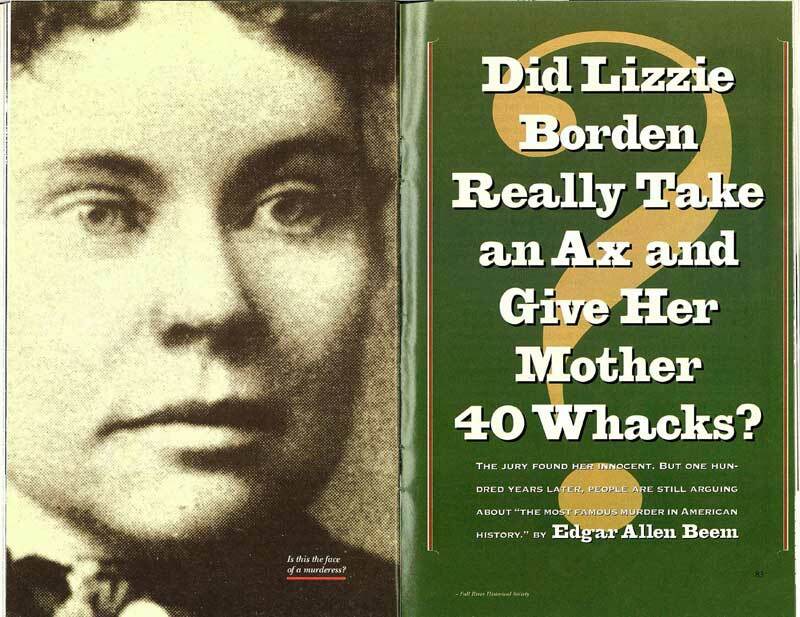 If you neglected to clip and save this for your Lizzie Borden Centennial Collection, Yankee Magazine now has it in the archive, also available in pdf format, complete with photos to print out. Arnie Brown and Professor Starrs are featured. This year the house outside was pristine, having just had a new coat of paint. The tent was up for visitors to wait under , shielded from the hot sun, and lemonade and hatchet cookies were ready for refreshment. Thanks go out this year to Debbie, Anna and Walter for keeping everyone cool and refreshed! 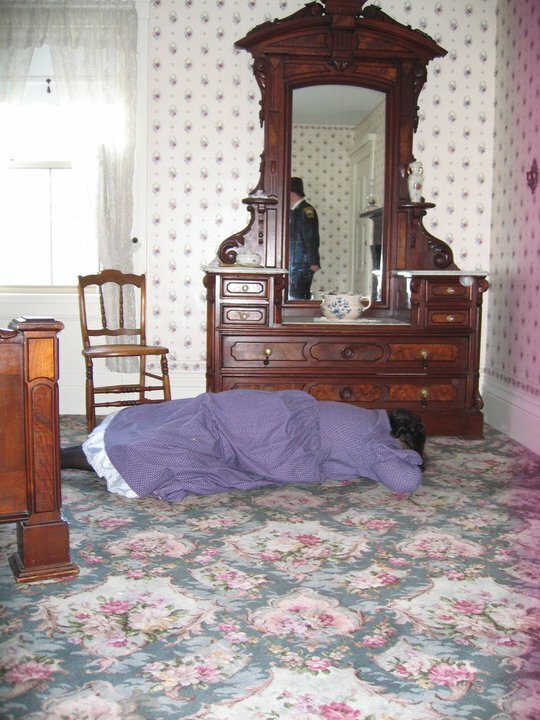 This year the bed in the guest room where Abby Borden was killed was moved in order to reproduce the photo of Abby taken from the door way. A blood-spattered coverlet and shams were on the bed as well as a tuft of hair. More blood was used than on the genuine article which was on display down at the historical society in a special Bordenalia exhibit. It is remarkable that the crime scene still exists after so many years, so everyone who visits is very forgiving of modern conveniences such as electric sockets, lamps, refrigerators, etc, and turns a blind eye to these minor things which distract from time travel to 1892. 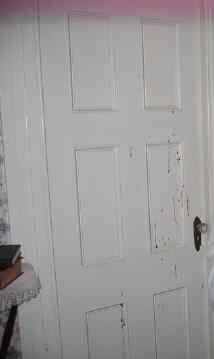 The dress worn by Elizabeth Montgomery in The Legend of Lizzie Borden, and other clothing items usually on display were put in the upstairs bathroom, which at one time was actually a dress closet. Down in the cellar, the search for hatchets and other possible weapons, conducted by Detective Seaver, gave a glimpse to visitors of just where these items were found, and offers a visit to the Borden cellar, always a place guests wish to see. Using a detailed sketch of the rooms done by Kiernan in 1892 as reference, Lizzie’s fainting couch was placed where it had been, between the two windows. 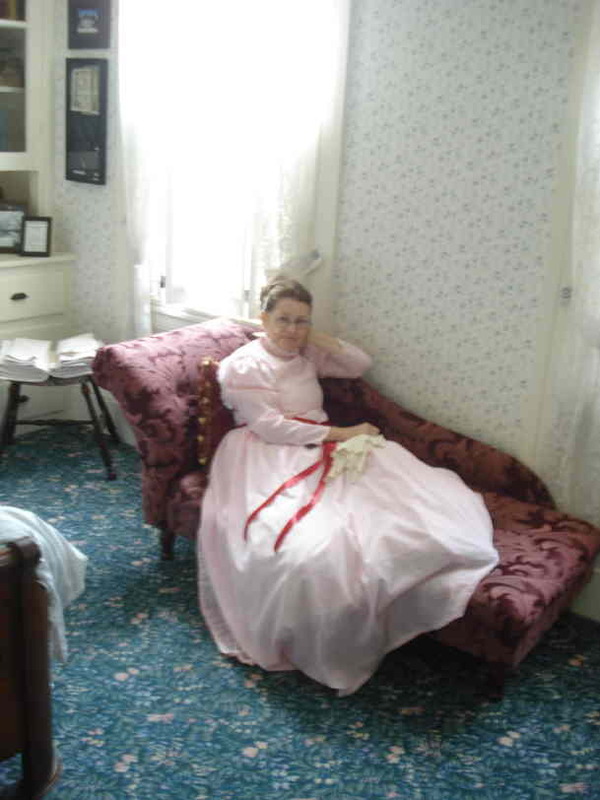 Lizzie lounged with her pink and white wrapper with cherry ribbons which Officer Harrington would later describe in such detail that it brought a smile from Lizzie in court. With so many period antiques in place in the house, dressing the house for a performance is easy. 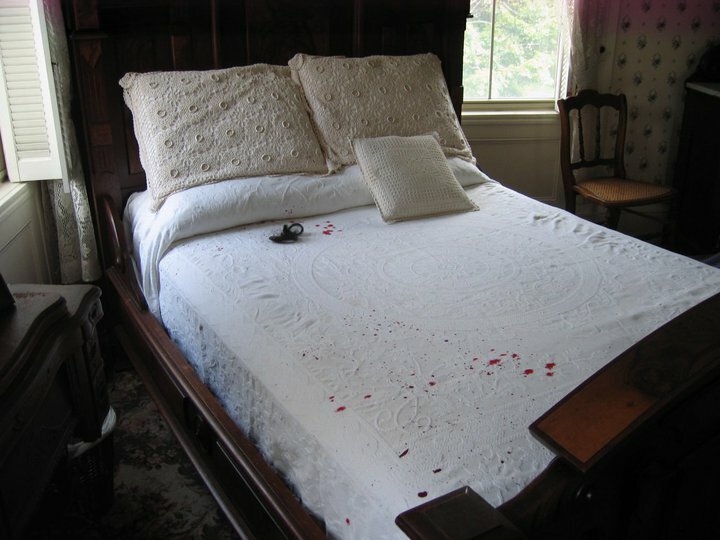 The two crime scenes are particularly accurate in furnishings, and most guests take note of this as they examine the 1892 photographs. With just a little imagination, it is not hard to go back in time and visualize how the rooms must have looked. At 9:30 and 11 a.m., a hush always falls on the house as cast and guests recall what was happening so many years ago. Food Poisoning-An Inspiration and Cover-Up? Baker’s bread, fish and milk- tainted or tampered with? On the morning of August 3rd , Abby Borden arose early as usual and breakfasted on pork steak. This seems an unusual choice for a woman who was suffering from nausea and extreme digestive disorder. The night before, Abby and Andrew Borden were up and down to their chamber pot experiencing all the symptoms of food poisoning. Lizzie would say that she too had suffered some discomfort. Fish had been on the menu Tuesday evening. Had the fish “gone off”? As soon as Dr. Bowen’s office across the street opened, Abby dashed over to find relief. Dr. Bowen listened to her concerns about the “baker’s bread” perhaps being “poisoned”. That would seem to imply Abby was thinking along the lines of food poisoning. She had heard of a case before where cream cakes had gone bad and caused similar symptoms. Food spoilage with resulting salmonella, botulism and “Summer Complaint” were a day–to-day occurrence in the Victorian era. Bowen observed that if the baker’s bread from the market had indeed been spoiled, he would have had far more patients and inquiries, He prescribed castor oil as an emetic, and sent Abby home. Later he would remark that he had some fear she would be sick right in his office, and later crossed the street to check on her and Andrew. Lizzie, when Bowen came over, high-tailed it up the front stairs to her room. Andrew Borden did not wish to be examined and was not pleased his wife had incurred a bill for services rendered by Dr. Bowen. He dosed himself with Garfield tea. 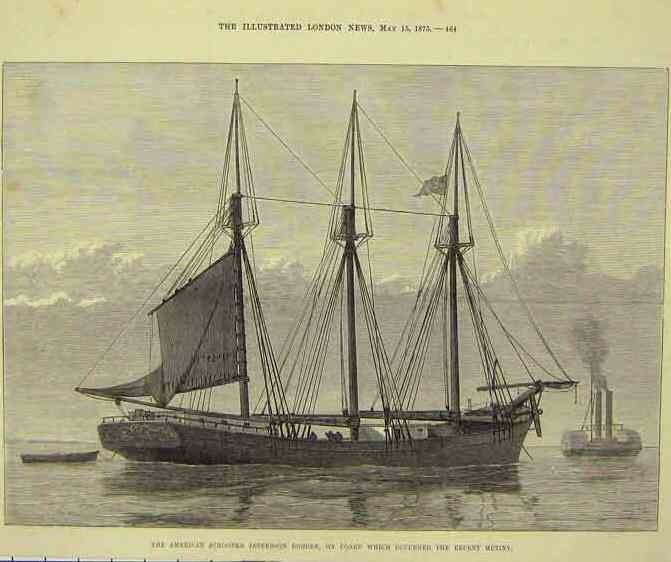 During the same morning, pharmacist clerk Eli Bence would claim that Lizzie demanded of him 10 cents worth of Prussic acid with which to clean a sealskin fur, claiming she had bought it there at Smith’s before. Lizzie would deny even knowing where Smith’s was located, although it was but a block west and south of her home. The time is placed between 11-11:45 a.m., or about 3-3 1/2 hours after Abby’s dash across the street to Dr. Bowen’s. Is it possible that Abby’s “food-poisoning” might have served as the inspiration for the attempted purchase of Prussic acid only a few hours after Abby’s trip to the doctor? 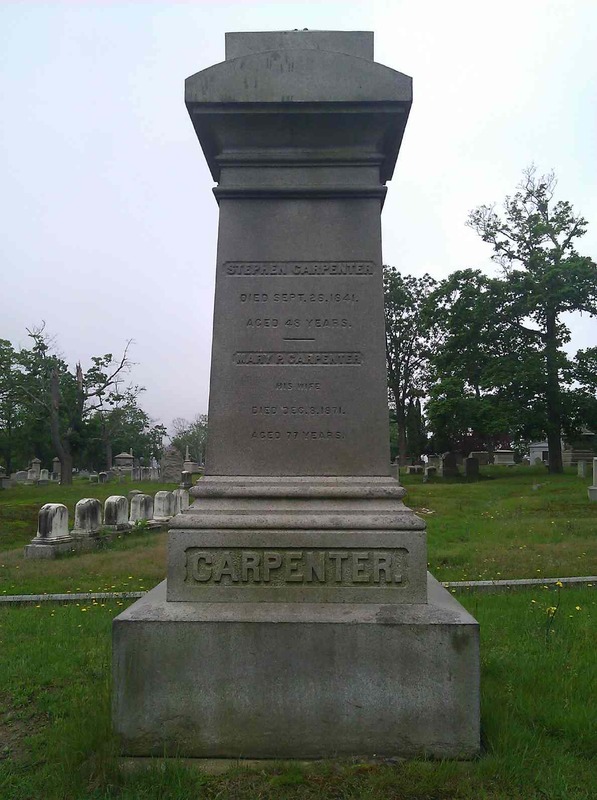 Abby’s subsequent death from deliberate poisoning might easily have been attributed to an acute case of food poisoning, and given Bowen’s testimony of the morning’s events, most likely an autopsy would not have been performed. No one was able to confirm or witness the the claim that Lizzie herself was actually sick with the same complaint the elderly Bordens suffered. A poisoner is always prudent to say they have also been sick, even to the point of ingesting a minute amount of poison themselves to achieve a mild result. A most intriguing follow-up to Wednesday’s events occured when Lizzie visited her longtime friend, Alice Russell, Wednesday evening and promoted the story that the family had all been sick, she had fears the milk was being tampered with, and something terrible could happen at any time. “I don’t know that they won’t burn the house down over our heads”. The seed that “father has an enemy” was firmly sown, and the notion of deliberate poisoning was tossed out as a possibility. On the morning of August 4th, the maid, Bridget Sullivan herself was ill, vomiting in the back yard around 9 a.m. She ate the same food as the family, including the leftovers. If one believes Lizzie to be guilty of the crimes, and that Eli Bence was telling the truth- her failure to procure the Prussic acid could have prompted another surefire method of disposal- a hatchet! Results guaranteed every time.